Warren magazines began with “Famous Monsters of Filmland” in 1958. It was an immediate hit. It was also profitable as it was quite cheap to produce. All they needed were a stack of still photos of old horror movies padded out with words. So Jim Warren began to think of other magazines that could capitalise on this winning formula. 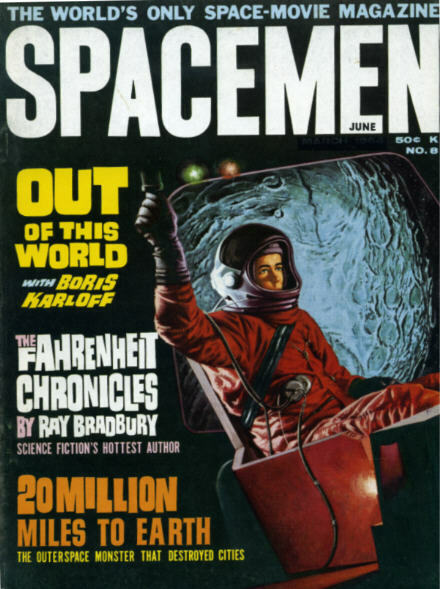 Science Fiction seemed an ideal candidate but amazingly (as DC and other comic companies of the time discovered) science fiction wasn’t THAT popular by the early 1960s and No 8 was the last issue. One odd fact. The date of “March” on the cover (next to the price of 50 cents) has been carefully blacked-out and “June” has been carefully printed on the title itself. This was evidently done by the publishers. Did they just get the date on the cover wrong? The interior contents page says June. I like the pun on “special” for the heading to the letters page. Warren also tried magazines about movies in general. 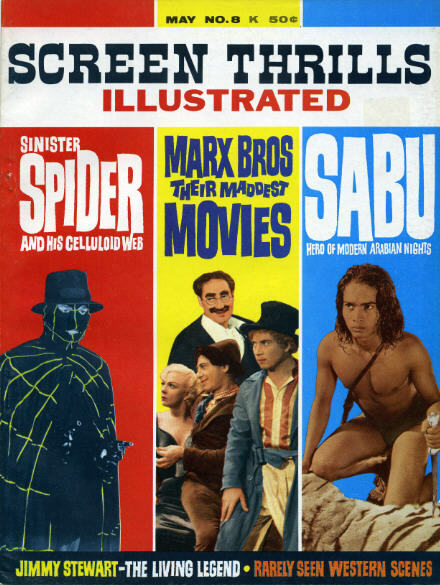 Screen Thrills Illustrated lasted 10 issues. 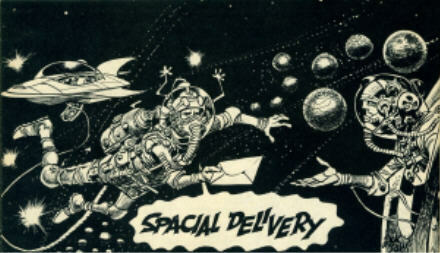 This advert was on the back cover of issue No 7. Does anyone know if Warren actually produced this film they are describing? Perhaps it was sold later through “Captain Company”? 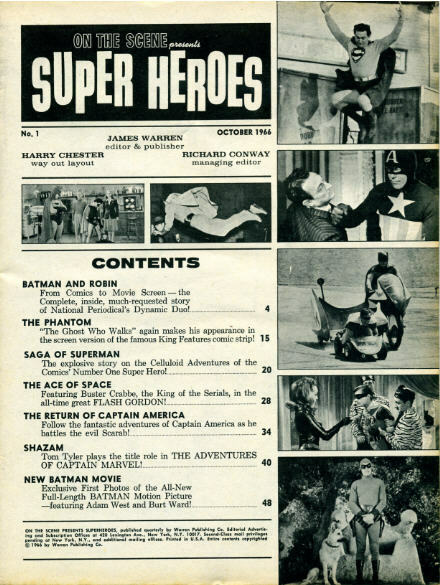 In 1966 (no doubt spurred on by the success of the Batman TV show) Warren tried again with this one-shot cash-in magazine. 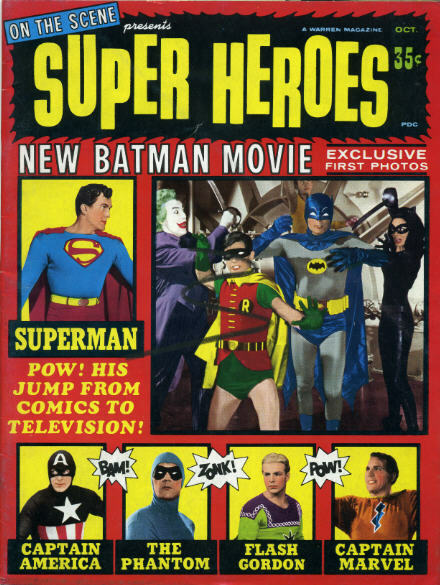 Apart from the article on the soon-to-be-released Batman movie the magazine was full of articles about ancient serials. Although the articles seemed fresh and exciting to me at the time. 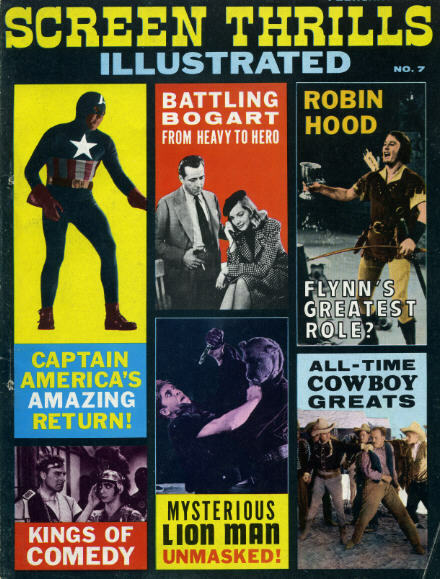 In 1966 I was attending the local cinema for the children’s saturday afternoon matinee which was still showing the pre-war and early post-war cliff-hanger serials like Flash Gordon and The Phantom that were featured in this magazine!! This magazine was priced at a more reasonable 35 cents. 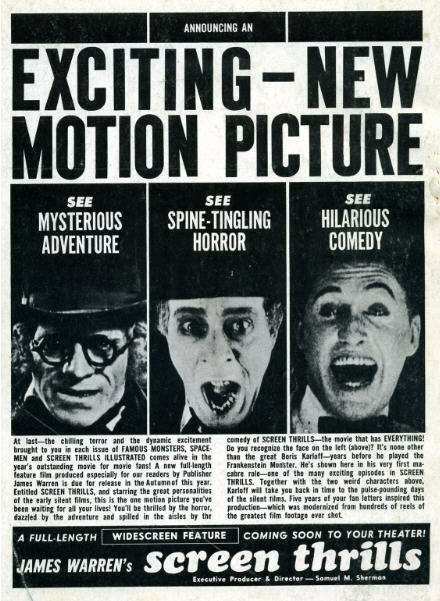 Screen Thrills Illustrated from two years earlier cost an enormous 50 cents!